A film documenting the rise and fall of the Britpop music phenomenon has received its première in London. Live Forever, named after an Oasis anthem, charts how bands such as Pulp and Blur embodied the era now dubbed Cool Britannia. Blur's lead singer Damon Albarn and Oasis brothers Noel and Liam Gallagher talk frankly about their rise to fame in the 90s but also how they became disillusioned. Artist Damien Hirst, who was a leading light of the movement, has created limited edition posters to promote the movie which are expected to sell for £1,500 each. Only 1,500 prints have been made and will only be displayed at cinemas showing the film. The poster is based on an untitled painting by Hirst, who also appears in the movie. Albarn tells of the time he entered into a constant round of TV interviews at the height of the Blur and Oasis chart battle. He said he was left feeling "stupid" and "very confused". 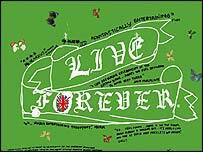 Live Forever also focuses on how politics muscled in on the Britpop bandwagon. 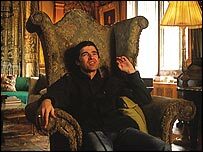 In 1997, Prime Minister Tony Blair invited a host of celebrities to Downing Street for a drinks reception, including Noel Gallagher. The former lead singer of Sleeper, Louise Wener, praises the influence of Oasis in the film but criticises their appearance alongside Mr Blair. "It was so depressing when Noel went to Downing Street," she said. "In that very instant he was neutered." The film goes on release on 21 March.